A review in 10 words (or thereabouts): The listening experience - how best to look like a crazy person in your car. Tina Fey tells her story. From maxi pads to New Year's Eve, each story is filled with her trademark sarcasm and wit. The only way to truly experience this book is through audiobook format. Read by the author, you get the full effect of her hilarious trials and tribulations, personal philosophies, and great comedic timing. Best of all, Fey is extremely down to earth. There's no pomp. No circumstance. Just a regular gal navigating a male dominated work place while learning to survive motherhood. The book is kind of all over the place. While this isn't necessarily a problem, it's hard to keep track of when and where you are in the Tina Fey timeline. I really did look like a crazy person driving around in my cars. It's laugh out loud hilarious. Tears streaming down my face. Hard to see. 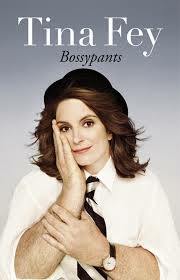 Bossypants is just a lot of fun.